Many coffee fans love the simplicity of a french press but they would like a little more guidance on choosing the best ground coffee to use in one. Well if you want a short answer, this is the best ground coffee (Koffee Kult Medium Roast Ground (B00THPH2FA)) to use in your French press! A French press is a device that brews coffee. Cylindrical Beaker or Jug: -most often made from glass or clear plastic. Lid: most often made from metal or plastic. Rod/ Plunger: with a tight fitting fine mesh or filter attached. A French press has many different names. French press is the most commonly used term for it in the USA. In Australia and South Africa it is more widely known as a coffee plunger, whereas in the UK these devices are most often known as cafetieres. Ground coffee is placed in the bottom of the jug and then very hot water is poured over the grounds until the water is close to the top of the jug. The lid is placed on the jug and after 3-4 minutes the plunger (and filter) are pushed down to the bottom of the beaker. The coffee can then be poured into a cup. The video above demonstrates the eight steps required to make coffee in a French press. Step 1: Scoop one heaped teaspoon of coffee into the French press for every cup of coffee that you want. Step 2: Boil water in a kettle and then let it sit for 30 seconds. Step 3: Pour only enough water into the French press to soak the grounds. Step 5: Pour the remaining water into the French press. Step 6: Let it sit for 4 minutes. Step 7: Place the lid on and push the plunger all the way to the bottom. Step 8: Pour it into a cup and drink! This is a great video and rightly it is very popular because it is short and to the point. However, I strongly disagree with one of the instructions. I think that the lid needs to placed on the press before it is left to sit for 4 minutes as this will help the coffee stay hot. If the coffee is left to steep for 4 minutes without a lid on, it will lose lots of heat. The history of the French press is littered with Italians! The first device can be traced back to an Italian, Attilio Calimani, in 1929. Another Italian, Faliero Bondanini, modified the design some more and applied for a patent in 1958. Leak: Grounds can leak through the filter. Most of them are very porous. Grinds and sediments come through. Lukewarm: Without insulation, coffee can fall below serving temperature before you plunge. Fragile: French presses made of glass are very delicate. Difficult to Clean: Because they are so fragile. Simple & Cheap: There is not much that can go wrong with a French press and because of this they are very cheap. Eco- Friendly: French presses do not use bleach filters used in other types of coffee systems. And because they are not single serve systems, they do not require lots of plastic. Electric Free: French presses don’t need any electricity to power them which makes them very popular with coffee loving campers and walkers. Well, at least the plastic insulated models are! Despite our best intentions, we will not always brew a great tasting cup of coffee and this is especially true for users of the French press. Below I have listed some of the most common problems that people have with their French presses- together with some solutions. Let’s start with the issues that surround the taste of the coffee. Under extraction is when the coffee grounds have not been given long enough to steep in the hot water. Solution: The simplest way to correct this is to leave your coffee steeping for longer. The standard time that coffee should be left in a French press is 4 minutes. But if you are already leaving your coffee for this amount of time, try leaving it for another 30 seconds. An alternative way to prevent under extraction, is to make your coffee grounds smaller. The smaller the coffee grounds, the less time that the water needs to be left. But don’t be too brash. Remember, the best size grind for a French press is “coarse”. If the size of your grinds are too small they will end up slipping through the filter and turning into coffee sludge! Problem: If you cup of “Java” has a bitter or hollow taste then your coffee is “over extracted”. Over extraction is simply that the coffee grounds have spent too long steeping in water. Solution: Reduce the amount of time that your coffee steeps for. Are you leaving them for longer than 4 minutes? Or, as we were discussing above, change the size of your coffee grind. Problem: If your coffee has very little taste then your packet could be stale. Remember that once coffee beans are ground, they will start to lose their flavour not matter what packaging they are in. Solution: The best solution is to buy coffee beans not coffee grounds and then grind your own coffee just before you make it in your French press. If you don’t have a grinder and you don’t want all of the hassle associated with them, then buy ground coffee with a “best before date” on them and stick to that. The most common answer to this question is to use a medium or dark roasted bean to make coffee in your French press. The logic is that medium or dark roasted beans have more of their oils intact which will lead to a better flavoured brew. In truth, any kind of roasted bean can produce a great cup of coffee using a French press. Don’t let your thoughts on the type of roasted bean distract you from the most important consideration. 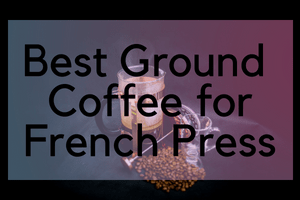 French presses require a very coarse ground size. If you have a grinder try it on the most coarse setting- your grounds should be slightly larger than coarse flakes of salt. In an ideal world, you don’t want to buy pre ground coffee partly because most of the “coarse ground” varieties available are not coarse enough but also because ground coffee goes stale very quickly. However, if you really don’t want to grind your own beans then make sure that you buy ground coffee that is fresh and a ground coffee that is very coarse. GREAT AROMA medium roast ground coffee blend. You will want to get out of bed just for the smell of this gourmet coffee in the morning. Cupping Notes: Big Body, Low Acidity. with a crisp sweet finish. ARTISAN ROASTED fresh roasted coffee to perfection on our small batch roasters, and roasted immediately prior to packaging. Every bag is consistently the same with our roasting profile system! SMOOTHEST MEDIUM ROAST cleanest tasting ground coffee beans ever. Bold flavor but smooth. Not bitter with low acidity. Best choice of gourmet coffees. Great for use in drip coffee machine, automatic coffee makers, cold brew, pour over and french press coffee makers. NICE BLEND of Brazil and Colombian coffee beans. This blend includes 100% specialty grade arabica coffee beans that are rich, smooth, medium bodied fairly traded beans. These exotic beans are blended into Koffee Kult medium roasted coffee. There are many types of coffee beans, these are the best gourmet coffee beans you can get. EASY TO ORDER Just push the yellow button to order your fresh coffee beans online. Order for your morning coffee or share this awesome coffee with people that deserve the best for birthday gifts, coffee gifts, gifts for her, gifts for him, and christmas gifts. Make waking up to fresh coffee in a coffee cup a reality. In truth there is no one variety of coffee that is suited to your French press as it depends on your individual taste. However, if you are a French press newbie, or if you are a experienced French press user who is stuck in a “coffee rut” then you might want to start with a medium roast or medium/ dark roast. Other than that, I have three different coffees for you that are (almost) guaranteed to make you a great cup of coffee in a French press. MEDIUM ROAST, WHOLE BEAN: Smooth, savory, seductive. The Three Sisters are a trio of towering Canadian Rocky Mountains. Pay homage to these powerful peaks. TASTING NOTES, BREW METHOD: Well-rounded and complex with notes of sweet tobacco, stone fruit and cocoa. Recommended methods: French press, drip machine, pour over and cold brew. ORIGIN INDONESIA, CENTRAL & SOUTH AMERICA: Grown in a socially and environmentally responsible way, by farmers with sustainable businesses they can depend on. Rich and chocolatey with considerable depth of flavor, a very smooth velvety body, and a clean caramel and cocoa finish.